Thomas McGuane, Ryan Gonzalez, Cameron MacDonald, Glaston Toft and Company. Photo by Jeff Busby. 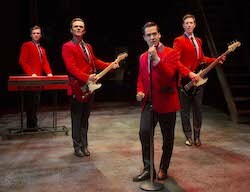 Jersey Boys is back in Australia after playing to rave reviews at Sydney’s Capitol Theatre in 2018! It will open at Melbourne’s Regent Theatre on Saturday, February 23 for an eight-week season. 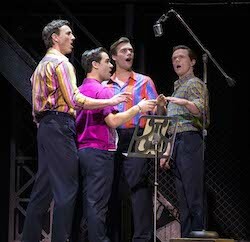 The hit musical recounts the true-life story of four guys from the wrong side of the tracks, and the rise to stardom of Frankie Valli and The Four Seasons, one of the most successful bands in pop music history. The band sold more than 175 million records and were inducted into the Rock ‘n’ Roll Hall of Fame for their worldwide hits, many of which feature in the musical. Glaston Toft, Ryan Gonzalez, Thomas McGuane and Cameron MacDonald. Photo by Jeff Busby. 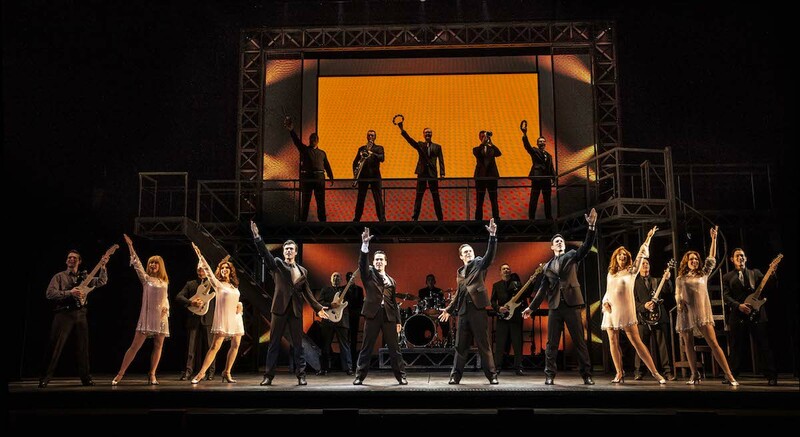 Now Dance Informa readers can win tickets to Jersey Boys! To enter to win a double pass to see the show on Tuesday, February 26 at 7 p.m., email info@danceinforma.com with the answer to this question: Which Australian theatre was Jersey Boys last playing at? Title your email entry “Jersey Boys Melbourne Giveaway” and include your full name, age and mailing address. This competition opens February 1 and closes February 20, 2019. 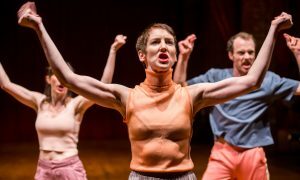 The dynamic cast combines exciting and emerging Australian talent. Stepping into the illustrious shoes of the charismatic singer Frankie Valli are Ryan Gonzalez and Daniel Raso, who share the role. They are joined by Cameron MacDonald as Tommy DeVito, Thomas McGuane as Bob Gaudio, who is making his career debut after graduating from the Victorian College of the Arts, and Glaston Toft, reprising his celebrated portrayal of the band’s musical marvel Nick Massi. Thomas McGuane, Cameron MacDonald, Ryan Gonzalez and Glaston Toft. Photo by Jeff Busby. 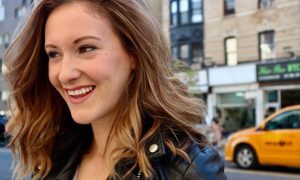 The dynamic line-up of ensemble artists includes Cristina d’Agostino (Green Room Award winner for Guys and Dolls), Mia Dabkowski-Chandler (Aladdin the Musical), Sage Douglas (The Wizard of Oz), MacKenzie Dunn (2017 WAAPA Graduate and making her professional debut in Jersey Boys), Glenn Hill (recently in Matilda the Musical), Luigi Lucente (Muriel’s Wedding), Enrico Mammarella (recreating his role as ‘Gyp DeCarlo’ from the original company of Jersey Boys), Scott McConnell (Production Company’s Jesus Christ Superstar), Josh Mulheran (The Book of Mormon), Jack O’Riley (Rent at the Hayes Theatre), Matthew Prime (currently in his graduating year at the Victorian College of the Arts and making his professional debut in Jersey Boys) and Rutene Spooner (making his Australian musical theatre debut). For more information, visit www.jerseyboys.com.au. Tickets begin at $69.90. To enter to win a double pass to see the show on Tuesday, February 26 at 7 p.m., email info@danceinforma.com with the answer to this question: Which Australian theatre was Jersey Boys last playing at? Title your email entry “Jersey Boys Melbourne Giveaway” and include your full name, age and mailing address. This competition opens February 1 and closes February 20, 2019.